I used to be one of those people who actually loved running. For a year or 2, I would run 3-4 miles most days. It was fantastic. When I got married and soon pregnant, I remember going on really long walks with John. We would walk for miles around our small town. Exercise was just a part of who I was. And then I had the little ones. As with many other new parents, exercise got put on the back burner. I tried joining a gym when Elijah was younger, but he hated going into the child care. 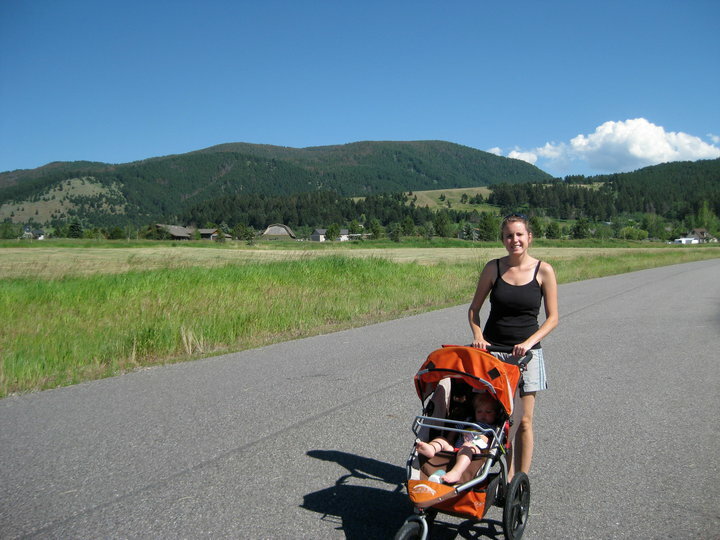 I also had a BOB jogging stroller, but I personally didn’t enjoy exercising with my kids…. not because the BOB isn’t absolutely amazing (it is)…. It’s more that I like to think of exercise as my time… my kid-free time. So… I’m at that point again of feeling unsatisfied that I’m not breaking a sweat more often. Between eating right and nursing, I’ve managed to keep my weight where I like it, but nothing compares to working out. When I exercise, most everything else health-wise seems to fall in place. I sleep better. I eat better. I just feel better. We are at the very beginning of winter in Montana, which means the odds are even more against me. The days are very short, and when it is dark and cold at 4:45PM every day, all I really want to do it curl up by the fire. So why am I telling you all this? Consider this a cry for help. I guess I am hoping some internet friend out there will offer me some encouragement or accountability. I’m going to start small and strive to stretch 5 times a week for at least 15 minutes and break a sweat at least 3 days a week. Seems easy enough right? I don’t want to put money into a gym membership until I am certain that I will use it. I am starting small, and hoping this will also help with the winter-blues. I intend on reporting back in a month with a positive report and a list of things that have helped me along the way. Moms, dads, anyone who takes care of little ones regularly… How do you do it? I know this isn’t rocket science. Please help! I completely agree. I thought I was the only one. With an 8 yr. old and a 22 month old, I feel like I have no time for anything let alone time to work out. But I am at that exact point and something needs to change. So… If you start I will start too!! Let’s get stretching!! Linda… I’m glad to know I’m not alone! So tonight after I posted I closed the computer and stretched! It felt great (in a painful kind of way) and I’m glad to have someone to hold me to it. As you said.. Let’s get stretching!